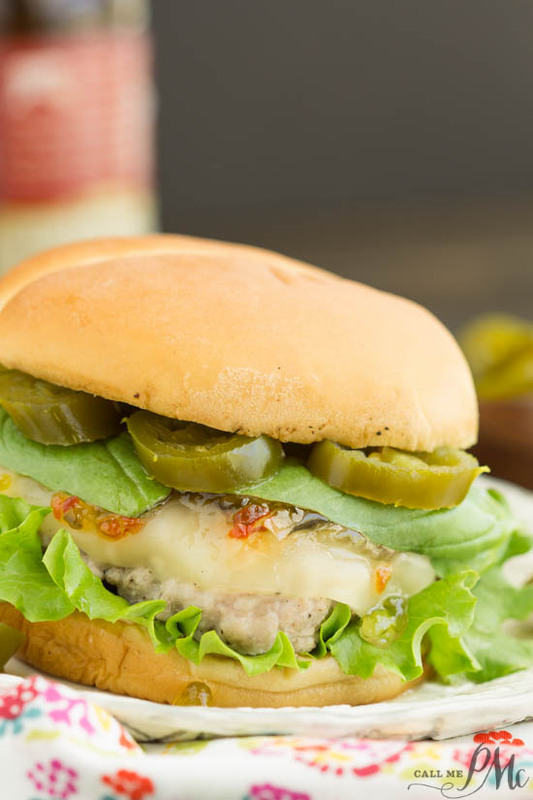 Spicy Jalapeno Pepper Jelly and Basil Sauce Pork Burgers is a fresh and delicious spin on a hamburger recipe. A peppery and spicy sauce beautifully flavors ground pork burgers. In 2011 on a whim, I entered and won the Mississippi Magazine recipe contest. That ultimately lead to me starting CallMePMc.com. It was an unexpected blessing. I love creating recipes and sharing them with you. I won with this recipe for Jalapeno Basil Pork Chops. It’s a very easy recipe to prepare with an impressive presentaits. With it’s unusually flavor combination, it has been a hit every time I’ve served it to guests. 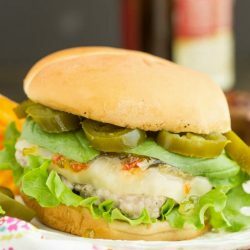 After making Tacos Pastor Pork Burger, and loving the tastes of pork burgers, I decided the convert the Jalapeno Basil Pork Chops into a Spicy Jalapeno Pepper Jelly and Basil Sauce Pork Burgers. This burger has all the tasty components of the entree in hand-held form! It’s spicy, hearty, satisfying, and easy to make! I asked my butcher to grind the pork since most ground pork is in sausage form. My ground pork mixture was an 80/20 ratio of protein to fat. Even at this ratio, I found them to dry out faster than beef burgers, so watch them closely when cooking. I melted provolone cheese on my burgers, but any mild cheese such as Havarti or gouda will be tasty. 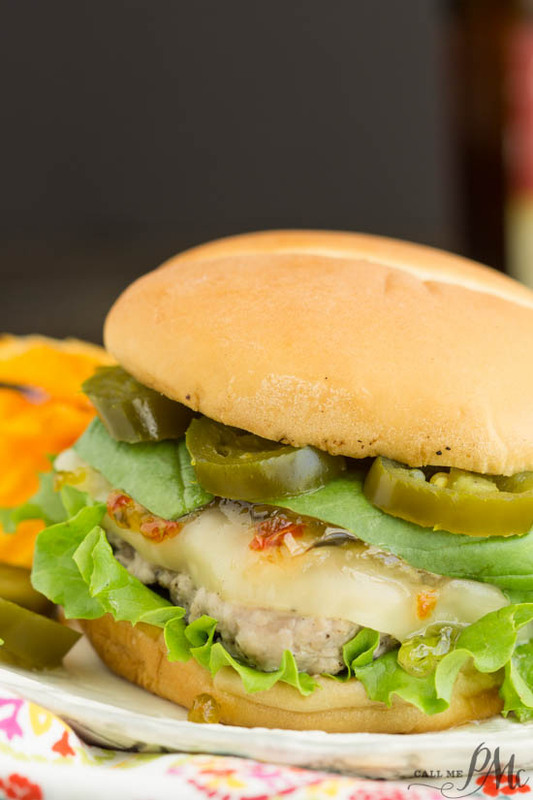 My Candied Jalapenos were perfect for this burger and are easy to make. If you don’t want to take the time to make them, you can purchase some here: Candied Hot & Sweet Jalapenos . You can also use regular pickled jalapenos. For your white wine, use any good drinking wine. I never cook with wine I wouldn’t drink. I used this brand of Jalapeno Pepper Jelly . Or, I use Tabasco . The Tabasco brand comes in red or green jelly, I use the red. 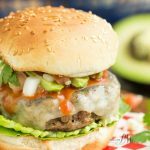 Spicy Jalapeno Pepper Jelly and Basil Sauce Pork Burgers is a fresh and delicious spin on a hamburger recipe. 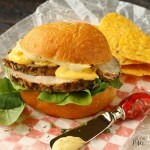 A peppery and spicy sauce beautifully flavors ground pork burgers. 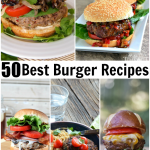 These burgers are spicy, hearty, satisfying, and easy to make! Season the ground pork with salt and pepper. Pat meat into burgers. I made large 1/4 pound burgers. You can make any size then adjust your toppings accordingly. Mix sauce together. In a small saucepan over low heat, combine jelly, wine, and basil, whisking for about 5 minutes or until pepper jelly melts. Remove from heat, and let mixture cool completely. Pour ¾ cup pepper jelly mixture into a large zip-top plastic freezer bag and reserve remaining mixture; add pork burgers to bag and coat with marinade. Seal and let marinate for 1½ to 2 hours in refrigerator. Cook burgers either on a stove top or grill 5 to 6 minutes per side on med-high heat. Turn just once and do not mash this will press the juices and flavor out. Layer burger, cheese, pepper jelly sauce, lettuce, basil, and mayonnaise on buns. Spicy Jalapeno Pepper Jelly and Basil Sauce Pork Burgers and Tacos Pastor Pork Burger are two of my epic burgers for #burgermonth. I would like to thank American Lamb Board, Anolon. Beef, It’s What’s For Dinner, Char-Broil, Curly’s BBQ, Cuttingboard.com, Melissa’s Produce, Primal Stone, Spiceologist , Thermoworks , & Veal Made Easy for their grill packages. This post is part of a month long burger celebration. 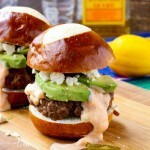 You can search #burgermonth on social media for other great burger creations from bloggers. And a special thanks to GirlCarnivore.com for hosting this event.